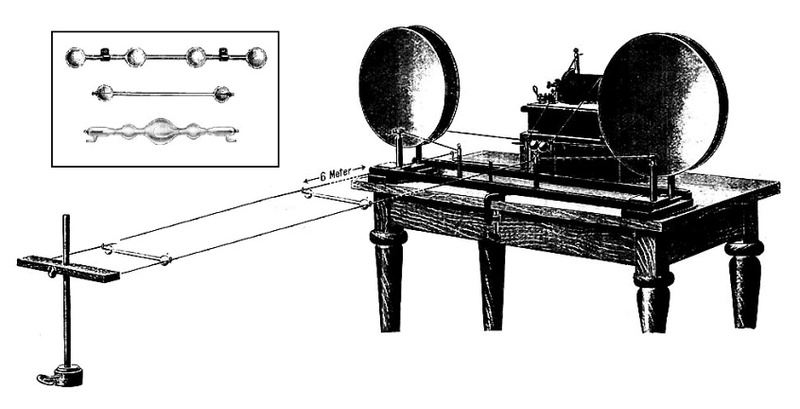 The Lecher tube is a long thin Geissler tube that was used by Ernst Lecher and early researchers in the apparatus developed around 1888 to measure wavelengths. Radio waves generated by an Hertzian spark-gap oscillator travel down the parallel wires. The wires are short-circuited together at the left end, reflecting the waves back up the wires toward the oscillator, creating a standing wave of voltage along the line. The voltage goes to zero at nodes located at multiples of a half-wavelength from the end. The nodes were found by sliding the Lecher tube up and down the line (two are visible on this picture). The high voltage on the line makes the tube glow. When the tube reaches a node, the voltage goes to zero and the tube goes out. The measured distance between two successive nodes is multiplied by two to get the wavelength of the radio waves. The inset shows types of Geissler tubes used with Lecher lines.